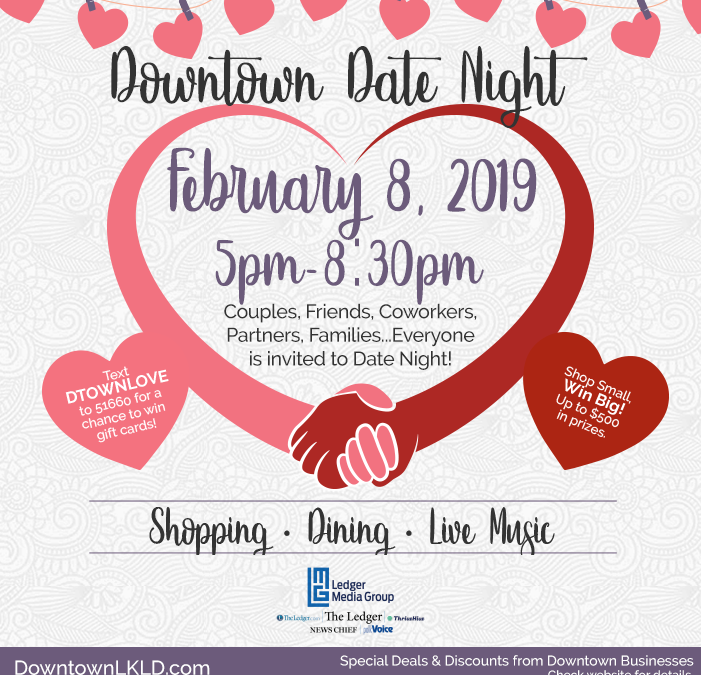 Downtown Lakeland’s next Downtown Date Night is Friday, February 8, 2019 from 5pm to 8:30pm. Bring your partner, spouse, coworker, or friend Downtown for a fun night out, and enjoy Downtown after dark. Stores will be open late, and the shopping will be great! Enjoy live music at various locations on North Kentucky Avenue to create a special ambiance on the street. We are excited to welcome Russ Brode, Bryan Rivers, and a Middle School musical ensemble raising funds for Viste. Take a special picture with your friend to commemorate the evening at a free photo booth (location T.B.A.)! Win up to $500 worth of Downtown Gift Certificates–the More You Shop, the More Chances You Get to Win! First, grab a foldable passport from participating merchants. Second, when you shop at participating stores on Date Night, ask store clerks to validate your purchases on your passport. Finally, at the end of the night, turn your passports in at Focus Realty on 218 E. Pine St. by 9:00 pm to be entered to win. You will receive one entry for every $10 that you spend at participating Downtown Businesses. Winners will be notified on Monday, February 11. Get your photo taken at a photo booth at the entrance to Munn Park (corner of Main and Kentucky), and walk away with a free memento from your fun night out! Downtown has free valet every Friday and Saturday evening from 5pm-12am. Drop off your car at the valet stand located in the Munn park parking lot on the north side of the park. Enjoy your evening, and when you’re ready to leave, have your car delivered to you at any Downtown location. 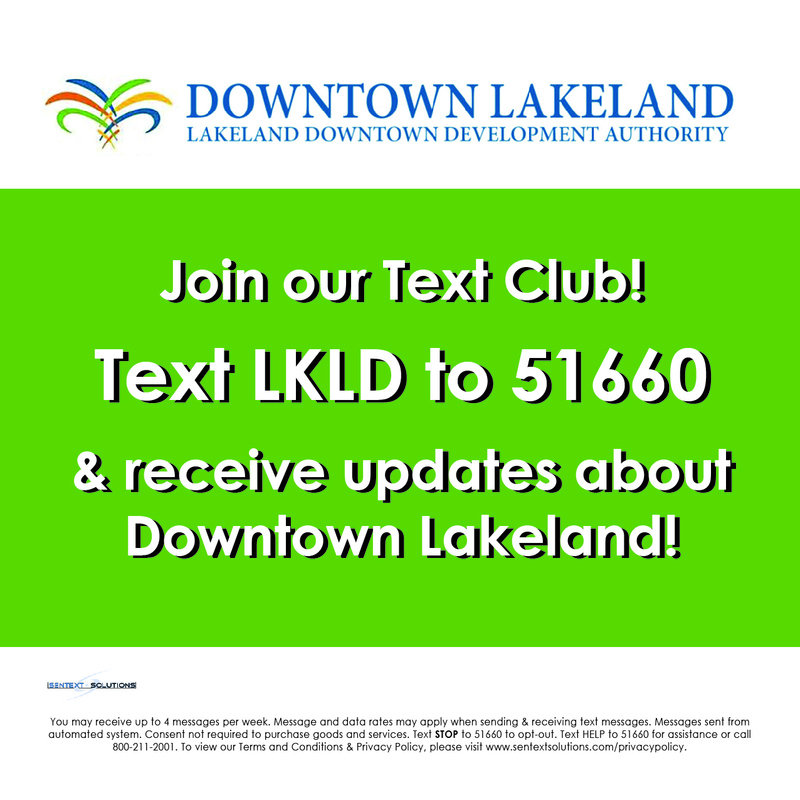 Text DTownLove to 51660 for two chances to win a $25 gift card to a Downtown hair salon or clothing store, and pamper yourself with a fresh style just in time for date night! The contest ends at 11:59pm on February 7, 2019, and one winner will be randomly chosen via the text message system on February 8, 2019. 5th & Hall at 117 S. Kentucky Ave. will be sampling beer and wine and offering 20% off sale items. Amelia Paige Boutique & Embroidery at 223 N. Kentucky Ave. will be sampling chocolate covered strawberries and Moscato Sangria. Enjoy a free gift with a purchase of $50 or more. Cake Makers Studio at 115 S. Kentucky Ave. will have special chocolate boxes and special chocolate-covered strawberries. Chop Shop at 118 S. Kentucky Ave. — Offering one FREE draft beer or glass of wine. Coppertree Boutique & Studio at 229 N. Kentucky Ave. will be serving wine and homemade cookies! Take 10% off all finished Jewelry. Make “His and Her Bracelets”–2 for $28. Escapology Lakeland at 210 E. Pine St. is offering $5 off per person with Promo Code: DDFEB19. (Offer isn’t valid with any other promotions, discounts, or group events pricing. Focus Realty at 218 E. Pine St. will have a chocolate fountain, chicken drumsticks, sliders, drinks, and a chance to win a television. They will also have “date night special” discounted loan fees for those looking to purchase a home this year! Home Essentials at 325 N. Kentucky Ave. will be sampling sweet and savory appetizers. Bundle and Save! For purchases of $100 or more, receive 20% off. See store for details. Jesse Carl Vinyl at 304 N. Kentucky Ave.–Shop for vintage music finds will listening to classic love songs. Just Dance at 124 S. Kentucky Ave. — Grab a special gift certificate for one private and one group class for only $30 (for singles or couples). Must be purchased on February 8th. Stop by the studio that night, and enjoy the Valentine’s Day social dance for only $10 (includes delicious refreshments and a special adult punch). Lakeland Art Guild at 117 N. Kentucky Ave. in the Downtown Lakeland office – Art Show & Open House Meet and mingle with local artists with opportunities to purchase local art. Wine & cheese sampling. Lakeland CBD Wellness at 225 N. Kentucky Ave. will be sampling Hot Buddha CBD Matcha Green Tea and non-CBD chocolate. Also, they will have a special on “his and hers” Valentine’s bundles for only $99.95 each. For her (for $99.95), receive 5 sample packs of High Tea, TruOrganics CBD 50mg bath bomb, CBD Living chocolate bar, Pure Spectrum 250mg tincture, and Charlotte’s Web 750mg CBD cream! For him, for 99.95, grab Sträva Craft Coffee 30mg, 60mg CBD Living soap bar, Quantum CBD H2O, Pure Spectrum 250mg tincture, CBD Living gummy rings, and Pure Spectrum muscle and joint relief lotion. They will also be doing free CBD product sample giveaways (while supplies last). Lakeland Escape Room at 308 E. Pine St. is offering $5 OFF per person for all Walk-in customers that mention DATE NIGHT. Lloyds of Lakeland at 301 N. Kentucky Ave. — Sampling chocolates and sweet treats. Sales up to 75% off select vendors. My Cottage Garden at 327 N. Kentucky Ave. will be sampling a variety of teas. Pita Pit at 127 S. Kentucky Ave.–Celebrate Fajita Friday with $1.00 off all day. Also, enjoy a free cookie with every pita purchased. Reborn Blowbar & Barber at 117 S. Kentucky Ave. is offering $10 off barber and blow dry services all day on February 8th. Revival Crafted Cocktails at 119 S. Kentucky Ave. — Sampling full line of RM Rose Bourbons and Whiskeys exclusively from Platinum Reserve Distribution, LLC. Scout & Tag at 244 N. Kentucky Ave. will be serving up Strawberry Mojitos and offering 10% off on all Jewelry, along with a free Valentine Gift Box & Bow. Taco Bus at 128 S. Kentucky Ave. — Offering a FREE bag of chips with meal purchase. Take Heart Fair Trade & More at 248 N. Kentucky Ave.–One regularly-priced item for 20% off. Top Buttons Boutique and Designer Thrift at 236 N. Kentucky Ave. will be offering a 20% discount on all full-priced new inventory (clothing, jewelry, and accessories). Traditions Unlimited at 221 N. Kentucky Ave.–Every purchase of $25 or more will receive a $5 off coupon to be used on a future purchase. Plus, sample some yummy sweets for you and your sweetheart. Tsunami Sushi & Hibachi at 114 N. Tennessee Ave. will have special Valentine’s Day-themed rolls and drinks. Live soft music. BOGO on all wine ALL day until closing. 50% off select appetizers. Reservations accepted.